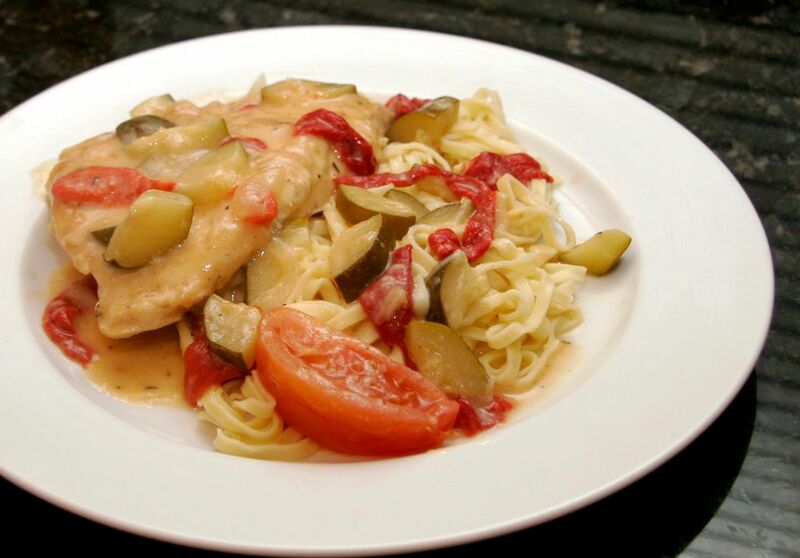 Purchased Alfredo sauce makes this dish a relatively easy and convenient preparation, and the combination of chicken, zucchini, and tomatoes is delicious. Feel free to use your own homemade Alfredo sauce or another cheese sauce you might prefer. Serve the chicken with a garnish of fresh grated or shredded Parmesan cheese. Put a piece of plastic wrap over a chicken breast and pound gently to flatten slightly to an even thickness. Repeat with the remaining chicken breast halves. Combine the flour, Cajun seasoning, 1/2 teaspoon salt, and a dash of pepper. Dredge chicken in the flour mixture. Heat the olive oil in a large skillet over medium-high heat; add chicken and cook for about 5 minutes on each side, until browned. Remove chicken to a plate. Add zucchini and saute for about 2 minutes. Add the lemon juice and chicken broth to the skillet, along with the browned chicken. Cover and simmer over medium-low heat for about 15 to 20 minutes, or until chicken is cooked through. Juices should run clear when chicken is pierced with a fork. Add the tomato wedges, roasted red pepper, and Alfredo sauce. Stir to combine ingredients. Continue cooking over until hot and bubbly. Taste and adjust seasonings.